In finishing my diorama with the LVA Fokker D.VII I would like to add a bicycle and a mechanic working on the engine. So far I have found lots of pilots and officers, sometimes clearly german or english, but somehow I miss the mechanic. As it is a plane on a dutch airfield (Soesterberg) a bicycle would be one of the most obvious additions. I tried Verlinden, WNW and others, but I don't seem to find what I am looking for. Maybe it doesn't exist, but perhaps somebody has some suggestions. I vaguely remember somewhere someone doing WWII German Bicycles with etch spokes. Unfortunately for the life of me I can't remember where. Mechanics wise, there are a few about or maybe mod a suitable figue maybe? Tamiya does a 1/35th set of two WW2 German soldiers with bicycles. If 'authenticity' is not crucial, then these cycles could look quite at home tucked slightly in the background of a diorama. The scale difference is slight provided they are not the focus of the scene. This may not be perfect but to my knowledge there are no WW1 bicycle models in 1/32 and the Tamiya set is the next best, and freely available. 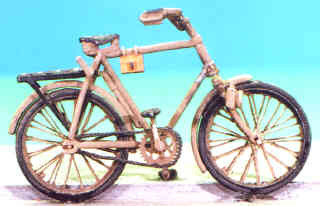 The bicycle pictured below is in 1:35 scale, it has some good PE parts and goes together quite easily, in a diorama it looks the part. I found this kit on ebay a few years ago and at the time only cost me $10, I don't know the brand of the kit, sorry. Thanks a lot for the hints. The bicycles look good to me. Just some small adaptation will have them look like a dutch bicycle. If the scale would be 1:35 that wouldn't be a problem as the wheel diameter in the Netherlands is mostly larger than in other countries. In the Netherlands 28inch is a normal mens bicycle, while in other countries a lot of bicycles have 26inch. The mechanics might do, just my japanese seems insufficient to be able to order anything from modelkasten. I tried their site earlier, but couldn't find the link you just provided. Now I can see them. I just have to do something with the funny hats. They look german or more eastern europe to me. I haven't seen such hats on pictures around 1920 in the Netherlands. Des, would this be the one you built? Very close Bud but not the exact same one as I built. This one would be just as good and even though it is WW2 it can be modified slightly, thanks for the link.